Kumagaya city is a developing city as one of the best sports city in Saitama Prefecture since Kumagaya Sports Culture Park opened in 1991. Kumagaya was the main venue for the 2004 National Sports Festival in Saitama and announced “The Kumagaya Enthusiasm City Declaration” in 2006. Kumagaya’s government has been accomplishing its goals for Kumagaya’s future such as a project that promotes the health for people in Kumagaya under the slogan of “Action”, “Support”, and “Cooperation”. We believe that sports are one of the main components in life that improve quality of life for people. Social advancement of woman became active in recent years, and gender equalization has been promoted even in the sports world. Amongst many different sports, Kumagaya is widely known as the Rugby Town as “west of the Hanazono, east of Kumagaya”. In the future, we consider the promotion of women’s rugby essential for the development of the local community as the rugby town. However, rugby players, coaches, and facilities in the region are not sufficient at present. In situations which inter-city competition accelerates through advancement of globalization, we need to build an environment as Rugby Town in Kumagaya quickly. Sports including Rugby are foundations for personality development, physical fitness improvement, or health longevity. We have been requested to create an environment that enables education of acquired skill easier for developing sports individuals who work worldwide or many of the people who need the power of sports. Today, a lot of expectation is directed toward our NPO activity which has the keyword “community development by sports,” and it has been desired to perform its function while forming a scrum with companies, universities, government, and citizens. At the Rio de Janeiro Olympic Games in 2016, men and women sevens rugby has been official stated as the main event, and the 9th Rugby World Cup will be held in Japan in 2019. In addition, the Olympic Games will be held in Tokyo in 2020. On this occasion, in cooperation with people in these areas and Kumagaya, we aim that Kumagaya become the world’s base for women’s rugby. We will contribute to the local society development and strive to promote sports by promoting rugby in close contact with the community. We aim for achievement of bright and energy-filled community through sports. 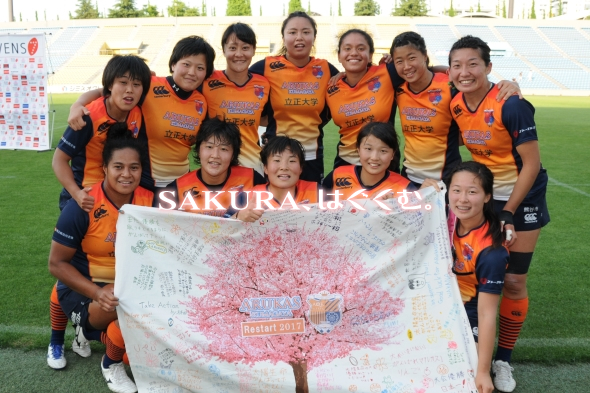 One of a kind women’s rugby club to nurture the Japanese national players with blooming beauty of SAKURA in this world is ARUKAS KUMAGAYA. ARUKAS KUMAGAYA, which loves everyone and is loved by everyone, will nurture the human resources of world-class. We cherish the Japanese spirit and bring up players who have a true strength with the foundations of manners and disciplines. Each player challenges to exceed oneself, and gives excitement and hope to all the people through our game.